The theme of the event was Robin Hood, but I knew all the women would go as Maid Marion or a wench and I wanted something different. 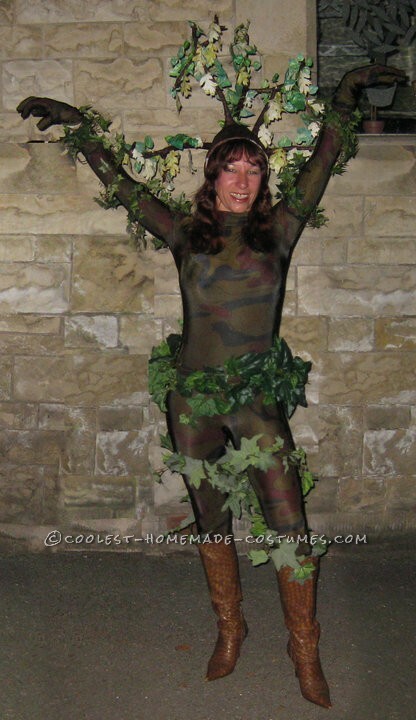 I went in an Oak tree costume. I started off making the hat by finding a bowl that fitted on my head. I then covered this with paper mache and let it go hard. Once it had gone hard, I made some branches out of scrunched up aluminum kitchen foil , which I rolled into various branch like shapes and stuck these on using sticky tape. Once I was happy with the branches I then also covered these in paper mache. This took me a few days of leaving them to harden at various stages so that the branches held their position and did not flop with the weight of the paper mache. For the final layer of paper mache I used brown crepe paper all over in strips, which gave it a bark like appearance. For the leaves, I brought a piece of material from Ebay which was printed with leaves on and sat and cut them all out. I also brought a length of leaves used for flower arranging and also cut these off. I then threaded the leaves together using fishing wire (so that you could not see it) and carefully wrapped the leaves all around the branches. The hat was now finished. For the final outfit I put on a Lycra suit and wrapped some more leaves around my waist and put the hat on my head. I received a fantastic response and won first prize of a lovely engraved trophy.